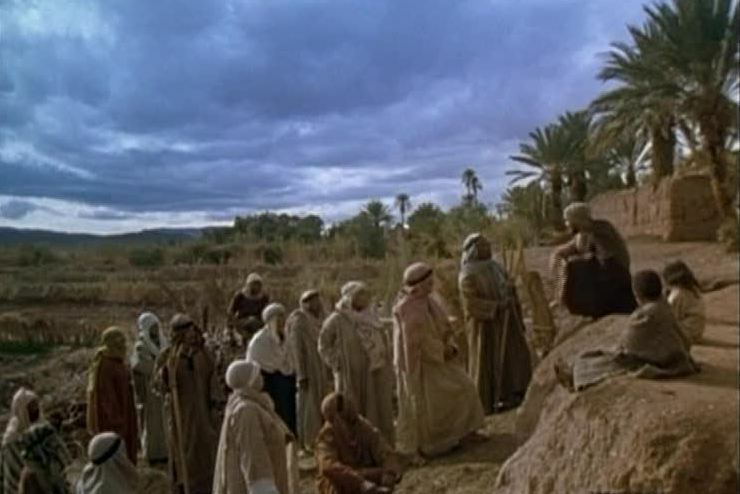 It took Cecil B DeMille nearly four hours to tell his version of the Moses story - even longer if you count the ten minute theatrical trailer. So it's interesting to see someone else tell the story in just half an hour. Whilst this film ends a good deal of time before the giving of the Ten Commandments, it still manages to tell the story of the first fifteen chapters of Exodus very effectively in such a short time frame. Of course elements are missed out. 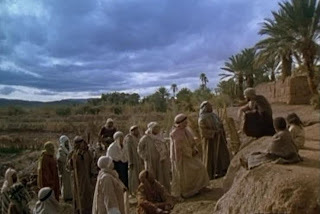 Like many Moses films not all of the ten plagues are shown, and other common omissions, such as God trying to kill Moses on the road back to Egypt, are also excluded. Running time is also cut back by telling the story of Moses' birth and childhood in a flashback along with an account of Moses murdering an Egyptian. 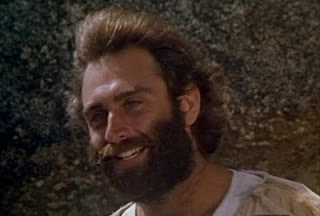 The film opens with Aaron aiding Moses' escape from Egyptian soldiers. Like most of the Testament series the animation uses a more expressive style, marking it as much for adults as for children. Here the characters all have a lithe, elongated shape which lends them a sense of elegance - fitting for what is essentially a battle of wills between a Pharaoh, a former prince and the sovereign God. The animators also use their medium to great effect. Aside from the flashback, set against a deep red sky, there is also a literally red Red Sea. There's also a notable moment when the tenth plague is shot from the point of view of the Angel of Death, and the closing zoom out shot is cleverly executed. Two years after this film the more well known animated version of this film hit the silver screen. The Prince of Egypt had a much larger budget, but seems to have drawn at least some inspiration from the earlier film. 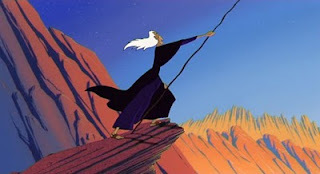 Aside from the expressive use of animation, the opening scenes emphasising the rivalry between Moses and the Pharaoh, in this case Menephtah (son of Ramsees II). They even compete in chariot races. But this is one of the few Moses films to show Aaron speaking for Moses, even if Moses does take over in the end. It also uses the correct initial request of Moses and Aaron - to be allowed to go to worship in the desert. Such fidelity to the original text is matched by the subtle ways the film introduces elements of historical context into the background. For example, the blooding of the Nile takes place during a religious festival celebrating the God of the Nile, and there's also a mention of a frog god who is quite literally toppled by a plague of his amphibian minions. The script also reminds us that Pharaoh himself was viewed as a god, and that ultimately it is he, rather than the idols that adorn his palace, which is Yahweh's primary target. Overall, this is one of the strongest entries in the Testament series, with fine voice work from Martin Jarvis as Moses and Simon Callow as Menephtah, but it's the vivid illustration which really catches the eye and gives real significance and texture to this most critical of Old Testament stories. This is one of a series of reviews of the films from the series Testament: The Bible in Animation. The entire nine-film series has recently been re-released on DVD by the Bible Society. (From a series of posts working through the Visual Bible's Matthew). Matthew starts of narrating the beginning of chapter 24 and he also appears to have sacked his oft sleeping scribes and is now doing the job himself as he talks about the destruction of the temple there's a real sense of sadness, and that, along with Matthew's likely age suggests that he is writing after the fall of the temple has occured. Jesus however is much more nonchalant, particularly in comparison with his weeping over Jerusalem just a few verses ago. Matthew comes in and out of this one. One notable example is that it is he who says "let the reader understand" rather than Jesus. Anything else I suppose would be somewhat nonsensical. There's a shift in time as this discourse unfolds in contrast to the text which suggests this is all spoken in one go. Here they move from the night to the day and back again for different passages. The later parables such as the wise / wicked servants, the ten virgins and the Parable of the Talents are all dramatised, the first with workers in a field, the second with women by a stream for the ten virgins, and by the side of the master's house for the final of the three. There's no illustration for the story of the sheep and goats, which is again delivered with a sense of compassion for those that with be thrown out. Marchiano again does well here, personally speaking I prefer his more serious mode of delivery then when he's goofing around, not that a few of those moments aren't very welcome, but these mometns feel more natural. Just a short one today as I'm really pushed for time. As is probably fairly obvious, I'm studying Matthew's gospel at the moment so apologies to any regular readers who don't have much interest in that. Anyway, I just came across a 2004 article from The Times (London) about Enrique Irazoqui, about his experiences playing Jesus in Pasolini's version of Matthew, Il Vangelo Secondo Matteo. 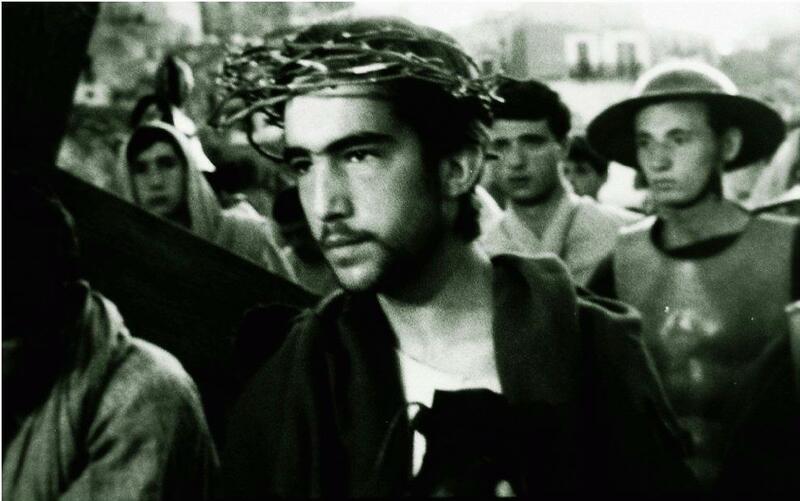 It tells a few interesting stories and it's interesting, if not surprising, how much Pasolini's attitude to his Jesus actor contrasts with that of other Jesus film directors, DeMille in particular. There's also a bit more on Irazoqui's life after the film here, including a number of links. Chapters 22 and 23 nominally take place in and around the temple. The section opens on a close up of a lion with red smoke pouring out from between its paws. I'm not entirely sure what this statue has to do with anything (I'm not aware of a lion statue known to have been present in the temple or even Jerusalem. There is a Lion's Gate, but the lion engraved on it is not like this as far as I am aware). It is however, reminiscent of Last Temptation of Christ where a statue of Caesar is surrounded by more copious amounts of smoke. These chapters are almost entirely Jesus speaking, aside from a few points of narration and the questions from his opponents. First up is the Parable of the Wedding Banquet. By the time Jesus reaches the end, where he describes the inappropriately dressed man as being bound and thrown outside to weep and gnash his teeth, actor Bruce Marchiano is fighting back the tears. It gives a more compassionate view of Jesus, but it does raise questions about his God and his relationship to him. At this point, Jesus encounters opposition from several different Jewish groups: Pharisees, Herodians, Saducees and perhaps the teachers of the law. Unfortunately, the film doesn't really distinguish between the different groups. They all look the same. There is one distinction, the Pharisee / Herodian who asks Jesus about paying taxes does so in a West Country accent (south-west England). This is very distracting, like listening to the video of Darth Vader in Star Wars before James Earl Jones re-did the voice. It's this man himself who gives Jesus the coin, and when he's done Jesus throws it back to him. It's not a big moment, but a nice touch nonetheless. Jesus then deals with the question about the resurrection from the Saducees. Then there's a cut, another shot of the lion statue, before we move to a scene on the steps of the temple. This will be the setting for the rest of this chapter and all of the next. Jesus answers the question about the greatest commandment, and then replies with a questions about David's "the LORD said to my Lord". Jesus ends the passage and kissing the grumpiest (and seemingly leader) of the Pharisees on the cheek. The Pharisee does not react at all, except perhaps to look even more put out than he did before. Then it's time for the seven woes. It's one of the harshest passages in Matthew's Gospel, and Marchiano really goes for it, yelling "You snakes. You Brood of Vipers", but with sadness and sorrow as much as with anger. If anything Marchiano is even madder here than Irazoqui is when he delivers this passage. Ultimately though it all ends in tears, as Jesus weeps over Jerusalem sat on the floor. Compositionally, whereas the confrontation between Jesus and the Pharisee in chapter 21 saw them on higher ground and him lower down, this time Jesus is higher, stood a top the steps in what is presumably meant to be the temple whilst the Pharisees look on from below. They have already started storming off, but somehow stay to hear the end of Jesus' words. The grumpy Pharisee is getting madder and madder, but the reactions vary amongst his compatriots. One older Pharisee even cowers at one point, shielding his face as Jesus launches a fresh tirade. Strong stuff. 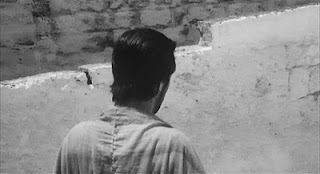 I've been working my way through the Visual Bible Version of Matthew's Gospel, but onSunday I sat down to watch the superior, if not exactly word for word, version of The Gospel According to St. Matthew by Pier Paolo Pasolini in 1964. You can read my previous comments on this film here and listen to my review of the film at my Jesus Films Podcast. Here, I want to record a few new observations that I made in watching it on Sunday, which I don't recall being made by others anywhere else aside from some of the elements this film incorporates from the Gospel of John. Some of those (I now recall) are also mentioned in Jeffrey Staley and Richard Walsh's "Jesus, the Gospels, and Cinematic Imagination: A Handbook to Jesus on DVD". Apologies if I have inadvertently borrowed from anyone else. It's often said that one of the primary views of Jesus that we see in this film is of the back of his head as he marches round the Holy Land shouting his words of wisdom over his shoulder. So it's interesting that early on the film gives us a similar shot of Joseph. Having been visited by and angel who tells him to marry Mary, he heads back to her house to let her know and the camera follows behind him up the path. Speaking of this path its used a few times quite effectively. Not only do we see Joseph initially leave Mary via it, and then return, but later on the adult Jesus will leave Mary by the same road, shot from the same angle, only he will not return. 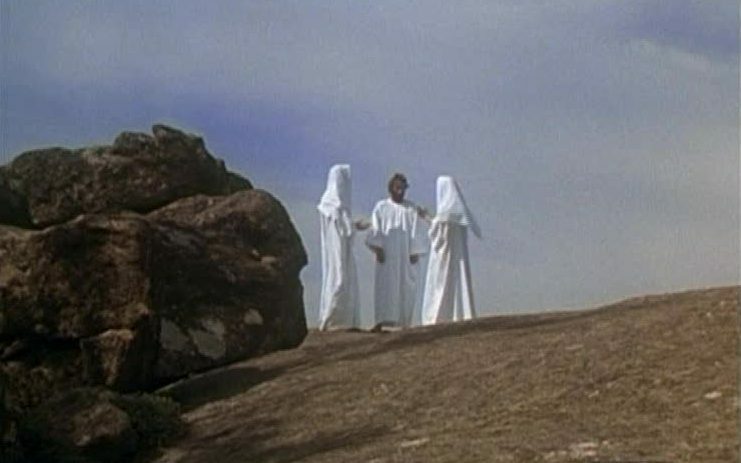 Pasolini rearranges the gospel order here so that this scene follows straight after Jesus claims that those who follow him are his mother and brothers. In fact the cut happens after a close up of Mary. We then see Jesus leaving and then realise that the location has also changed. Initially it appears to be from the mother and brothers scene, but then it emerges that it is a prelude to his rejection at Nazareth. This sequence also parallels Joseph's opening actions. Joseph leaves Mary, goes to a spot in Nazareth and observes the children playing before hearing God speak through the angel. Jesus also leaves Mary in the same manner and ends up in the same distinctive part of Nazareth. There's an interlude whilst Jesus is rejected by the villagers, and instructs the Rich Young Man, but then we get the "let the little children come to me" scene. Jesus has also seen the children play. One of the things that is usually mentioned when discussing this film is, of course, the music, but I'd not noticed before that several of the pieces of music used repeat two or three times throughout the film. One of my friends had some great observations on this, but I didn't fully get it, so I'm going to wait until he's finished his dissertation and see if he'll write something down on it. Watch this space. 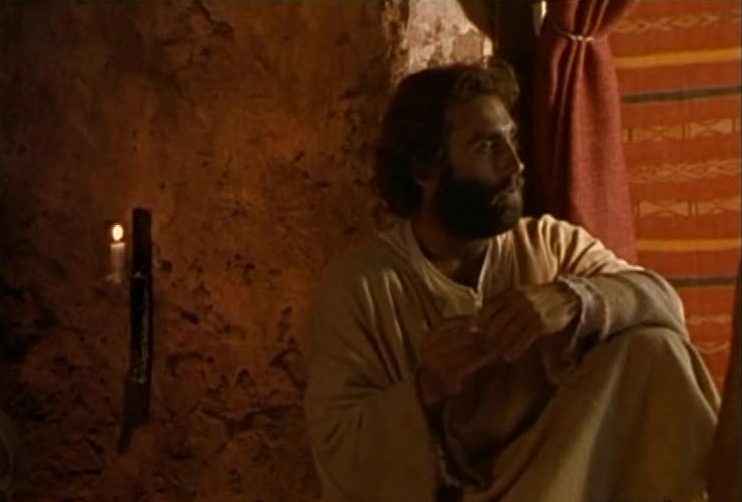 Whilst Matthew's Gospel never mentions that Jesus is the cousin of John the Baptist, the film implies it. Having met with John's disciples once, he encounters them in the same place and is informed of his death. Both John's disciples and Jesus have tears on their faces at this point, which is perhaps not that visible on the small screen. Again Pasolini tweaks the order here so that Jesus' "Let the dead bury their own dead" occurs at the end of this scene. In a similar fashion Matthew's Gospel gives no indication that John son of Zebedee used to be a follower of the Baptist, but whilst the Baptist is shown preaching we see the other John by his side, as in the fourth gospel. It also struck me, perhaps for the first time, just how Jewish the 7 woes directed at the Pharisees are. Whilst many of the things Jesus says are illustrating the wider point (that they are hypocrites) some of the examples are particularly obscure - swearing by the temple/gold of the temple, cleaning the outside of cups, and so on. The way the film abridges this section tends to emphasise the point I think. As Jesus' death draws near, he is anointed by the woman, and it's interesting that it's Judas who voices the objection to her actions. Again this is as in John, rather than the more general "disciples" we find in Matthew, but whereas John focuses on Judas to besmirch him, here it could be read as the thing that drives Judas to betray him. Unhappy with Jesus' actions he heads straight to the Jewish leaders, who he watched very closely during their debate in Chapter 21. That said it could also be read as supporting the Johannine position, not least because of Judas' smile when he hears how much he will be paid for his work. Lastly, again as with John's Gospel, we also see John the disciple at he foot of the cross comforting Jesus' mother. 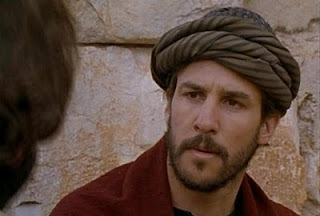 We're also given Jesus' trial before Pilate in a series of shots taken from John's point of view, intercut with extreme close ups of John's eyes. Thus far is this production, all of Jesus parables have either been delivered by him or acted out between him and the disciples. But for the first time we see one of his stories performed as if it was a real event. So Jesus begins the Parable of the Vineyard, but the scene cuts to a vineyard, an owner and a bunch of workers. Jesus still narrates, but the characters speak their own lines. Jesus follows this and then we get the mother of James and John (as opposed to the men themselves as in Mark) asking if they can sit by Jesus in his kingdom. Jesus reacts in typically non-confrontational and accepting fashion. The text then proceeds to talk about the other ten being indignant when they hear about what the two have done, suggesting either that they are in ear shot, or that at some point following on from that the news leaks out. Here however, Jesus leaves James, John and Mrs Zebedee and goes and sits with the disciples. The narrator tells us that the other ten are "indignant", but the accompanying image undermines this. They barely seem to care. Aside from this however it also makes it look like Jesus is telling tales, which seems worse given his niceness to the two brothers. Is he acting nice and then going behind their back? Jesus and his disciples approach Jerusalem healing two blind men en route. One of the actors just has his eyes closed, but the other's eyes are milked over. I was thinking this was going to be some kind of special effect, but when it comes to the healing we only see the man with his eyes shut open his eyes. Presumably, then, the other actor actually is blind. I can't decide whether this is a good thing involving such a man as an actor, or whether its a touch cruel. I suppose he knew what he was getting himself into. There's also a notable change in the music here. 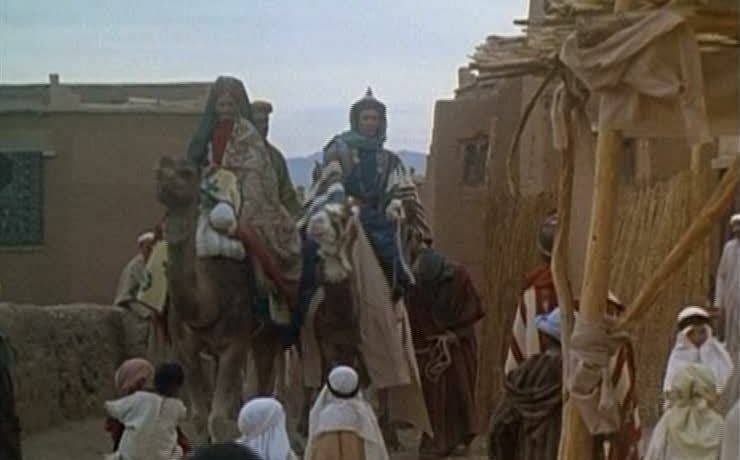 Whilst the victorious sounding theme music is heard during Jesus' triumphal entry, immediately before and after the music is, for the first time, much more ominous. Likewise before Jesus turns over the tables, and when the disciples spend the night in Bethany different, but somewhat suggestively negative music is heard. 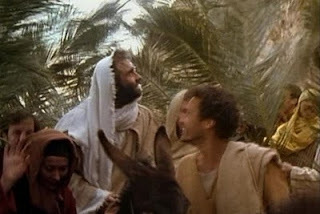 We only see one donkey (as in Mark and Luke, but not Matthew where there are two), and at one point we get Jesus' point of view as he rides into the city. There turning of the tables is filmed in slow motion. As with other Jesus films, no-one ever tries to intervene or physically restrain Jesus, and no-one seems to seek retribution. The reactions all seem a little unrealistic. The stall owners just get on with picking up their things, or occasionally shouting. Just for once I'd like to see someone attack Jesus, perhaps bloodying his forehead in a way that prefigures the crown of thorns. The fig tree is cursed and the camera pans back and cuts to another tree in a way that is hilariously unconvincing, and Marchiano's almost gentle delivery makes this passage seem even odder than it appears normally. Finally Jesus is involved in another confrontation with the Pharisees/elders and the chief priests. I say "confrontation", but again Marchiano portrays this moment in a very non-confrontational fashion, squatting down for the whole passage and looking up at his opponents, who are also on higher ground. There's an interesting discrepancy here, similar to what Mark Goodacre calls editorial fatigue, only in reverse. At the start of this passage (21:23) Matthew edits Mark's "chief priests, the teachers of the law and the elders" (Mark 11:27) to "chief priests and the elders". There's no mention of the Pharisees. But in concluding the section he refers to "the chief priests and the Pharisees" (21:45), in contrast with Mark's simple "they". 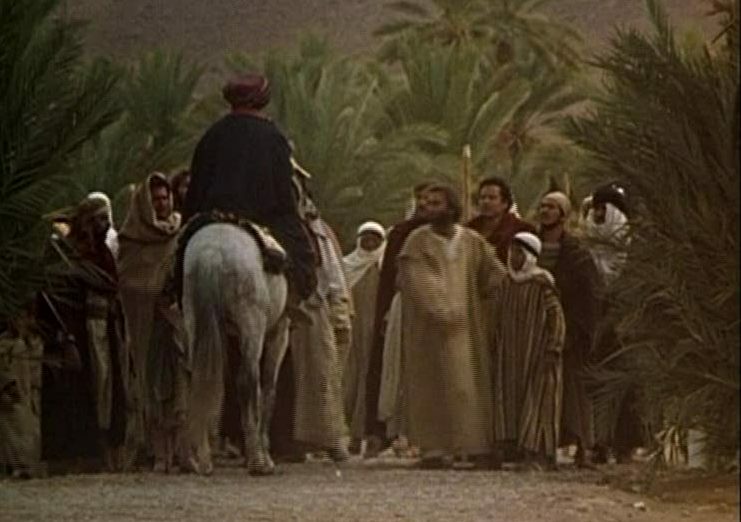 The Pharisees are much more significant in Matthew's Gospel than Mark's getting 30 mentions to Mark's 12, so it looks like when he came to the end of the passage the author of Matthew returned to one of his regular themes, the clash between Jesus and the Pharisees. When trying to think how to film Chapter 18 of Matthew's Gospel there's are a couple of problems. Firstly, many commentators consider the passage to be a composite of several shorter sayings, so how do you make them interact? Secondly it involves Jesus using some of his most violent imagery, in the presence of children. In spite of these difficulties it's presented fairly well. Jesus being grabbed by the children whilst saying "gouge it out" (or something) is a little jarring, but it does underline the hyperbolic nature of these sayings. This is followed by a cut to Jesus walking near some sheep as he delivers the parable of the lost sheep. My 2 year old spotted that one. Lastly there's another cut, this time to Jesus and the disciples by the side of a lake/pond, as Jesus discusses how to resolve disputes. When he comes to "treat him as you would a pagan or a tax collector" (18:17) he pauses before speaking the last 3 words, turning around to look at Matthew and give him a friendly touch. This portrayal clearly favours the interpretation that puts these words in the contexts of Jesus' actions, as opposed to the prevailing view of his culture. These two chapters are littered with Jesus and his disciples having fun. In addition to wrestling with children earlier on, we see the disciples wrestling by the aforementioned pond, and then a wordless scene where Jesus bathes under a waterfall. Shortly he'll be grabbing a ride by jumping on the back of a cart. Before that though we come to the Parable of the Unmerciful Servant. This is perhaps my favourite parable, and here Jesus and Simon Peter act it out. Jesus is much hammier than Marchiano. It does enliven the scene however and reminded me of Jesus' reputation for being a good story teller. The chapters end with the rich young man (pictured). In a way it's a fairly unremarkable portrayal, but it does bring out the disciples incredulity at what Jesus says. Rather than instantly agreeing there seems to be some confusion, and in fact now I notice that Matthew records that they were "astonished" by Jesus' statement. I've mulled this passage over many times, and yet I've never noticed what the disciples were probably meaning was "(if even the rich will find it hard), who then can be saved?". If the prevailing view of the time was that riches were a sign of God's blessing then this would be just what they might be thinking. I'm amazed that I've never seen this aspect before, but then I guess one of the main things I love about Bible films is the way they enable you to see new things in familiar texts. Here's its done very subtly which makes it all the more impressive. ...or at least, so says Deadline.com. According to director Peter Hewitt (Bill and Ted’s Bogus Journey) "he has left the production amid accusations that producer Philippe Rebboah has not paid below the line staff". Rebboah denies all this, but with filming originally due to start last week (15th) this is certainly a set back for the modern-day comedic take on the Nativity story. Deadline is also claiming that London-based producer and financier Studio Eight have also quit the project. Chapter 16 opens with some discussion with and about the Pharisees and Saducees. Again Bruce Marchiano delivers a good scene, although I still wish he was a little less touchy-feely. That's a personal thing however. The most significant part of of this chapter is Peter's declaration. It's a passage that Catholics and Protestants disagree as to how it should be interpreted. Is the "rock" that Jesus is going to build his church on Peter the man (as the Roman Catholics would argue) or the content of his declaration (as Protestants would contend). There's quite a significant cut to Matthew and his two scribes at this point, which comes after Jesus has told Peter that his words came from the Father, but before he says he is Peter and on this rock. Having the cut in this position leans towards Catholic take on hings. The more natural reading it seems to me is that Jesus means Peter rather than his words. Incidentally Matthew and his scribes are now by the side of a stream. The scribes are writing on their laps, rather than on the modern-style table they were using earlier. Mark Goodacre would no doubt approve. Chapter 17 is fairly uneventful apart from the Transfiguration (pictured above). It's a somewhat rare scene in Jesus films, tending only to be present in those films which are made by Evangelical Christian groups. Jesus appears to be leaning on one of the two men for support, it's not clear which of the two it is. The remainder of the chapter seems a demon-possessed boy healed and the strange case of the fish with a four drachma coin in its mouth (although the text never tells us that things panned out as Jesus said). The composition and lighting of this scene is really nice. This chapter in general features lots of close-ups which is particularly noticeable to me having seen Pasolini do the same thing in his version of this gospel. I'll hopefully write up about that tomorrow. The second half of Matthew's Gospel picks up on the story of John the Baptist. The daughter of Herodias performs a particularly unsexy dance (only Ray's King of Kings manages to find any hint of eroticism in this moment as far as I recall) and soon enough John's head is served up on a platter. This is depicted (as above) fairly gruesomely, which I think is actually to the filmmakers credit. It's a shocking act, yet often it's under emphasised. And thankfully it went, um, over my kids heads. (Daddy hadn't expected it to be so graphically depicted). 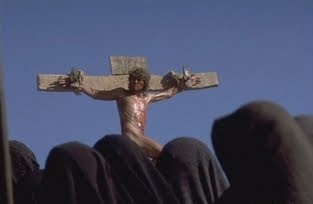 The film takes its time to show the impact this event had on Jesus. Marchiano does some great work here. Denied any words to express his grief, he manages to convey it all with his body without falling prey to hamming it up. The South African influence on the production comes to the fore in these two chapters as well. Herodias's daughter asks for the "hid of John the Biptist on a Plitter", and a couple of the disciples deliver their lines with a similar inflexion, most notably Simon Peter. This is a relatively strange experience. As with English accents, South African accents only seem to surface in most films if someone is a baddie (with the possible example of Patsy Kensit in Lethal Weapon 2, and hers is put on). Here they are both the baddies (as with Salome), but also the goodies. It's nice to see a bit of balance, even if it takes a bit of getting used to. Chief amongst the South African actors is Simon Peter. Unfortunately his performance throughout the film, and particularly in these two chapters, is very poor and the accent only seems to highlight the fact. To make matters worse, Peter is often given the generic lines which the text records only as being spoken by "the disciples". Next up is the feeding of the 5000 which seems to mirror the crowds gathering to listen to the Sermon on the Mount in the first half of the gospel. Twice the passage demonstrates some of the difficulties in reproducing an 'action' section of the text word for word. A disciple, bringing a basket containing the loaves and fish has to bump Jesus with it to get his attention (which I can't help feeling could have been avoided) and then when the gospel says "he directed the people to sit down" he has to rely solely on gestures whereas in reality you would expect at least some words to be used even if they were inaudible. I don't have much to say about the walking on water scene. 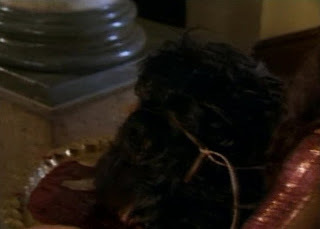 The effects are reasonably good for a low budget movie, but Simon Peter's acting somewhat spoils things. Chapter 15 starts with debate about what is clean and unclean with Jesus and the disciples working in the field. Jesus is stripped to the waist, which is a bold and unusual move. It works well, emphasising the humanity of Jesus in a usually unexplored fashion. It mirrors the opening of Last Temptation I suppose, but it's somewhat more striking here, perhaps because this is a more conventional Jesus, but perhaps because Jesus is outside. 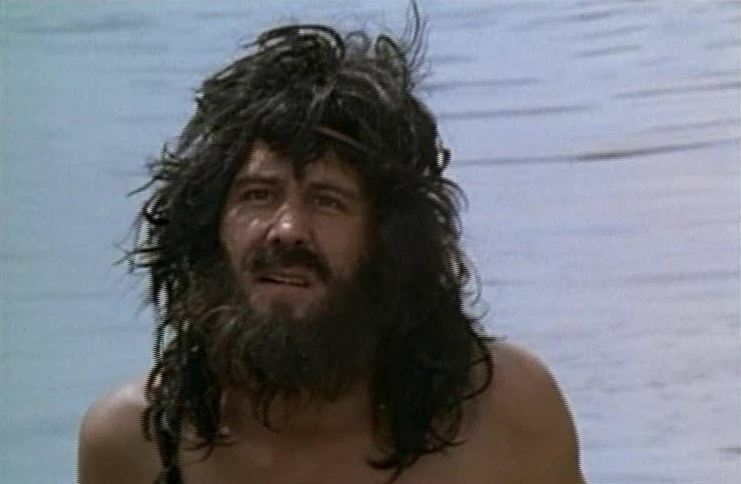 Of course nearly all Jesus films end up with a largely naked Jesus, but then it is, once again, within traditional parameters, and emphasises his status as a victim. Here it is presenting Jesus as normal in a way which is somehow vaguely shocking. It even stood out to my 4 year old. "Why does Jesus not have any clothes on Daddy?" We then get one of the more difficult incidents in the gospel - the request of the Canaanite woman. I've used this clip before for something but I'm not quite sure for what. The significance is that whilst the woman still cannot quite see him, Jesus indicates to one of the disciples (and therefore us) that what he is saying is not quite for real. Several commentators suggest at this point that Jesus is being ironic or questioning the perceive opinion in some way, so this seems to be the interpretation that is driving this portrayal. Personally it seems a weak theory, although the portrayal itself is quite strong. Marchiano makes the point well, but the actress playing the woman delivers a very moving performance in just a few lines. It's perhaps the most moving part of the film so far, which just goes to show how much of a difference good acting can make even in a low budget film. The section ends with the feeding of the 4000. I don't really have any particular comments on how the filmmakers portray this, other than that it stresses my confusion as to why this story is included given that Jesus has just feed an even greater number. Even if the ordering were reversed it would make some sense (with the greater miracle following the lesser giving a sense of Jesus' ministry getting more significant). It's there in Mark as well. If this were the Pentateuch then I'd be tempted to suggest it's just different versions of the same story coming through in different ones of Mark's sources. But given John's (admittedly later) boast about the wealth of Jesus material, and Mark's desire to tell the story quickly, even if there were two different events this second one seems somewhat surplus to requirements. Does anyone have any ideas on this? Much of Matthew 12 is from the triple tradition. The parallel passage in Mark is chapter 2, which shows how much other material Matthew has incorporated into Mark's account. The section starts in the grain fields with the disciples in trouble not for stealing (the modern day equivalent of eating grapes in the supermarket) but for picking the grain on the Sabbath. It's shown in slow motion from a lowish angle and fairly close up. Matthew is the offender that the camera homes in on (for obvious reasons). I can't quite decide whether this works or not. The unfortunate thing is that it doesn't offer any indication as to how this confrontation came about. What were the Pharisees doing in the field? This is followed by a long section in a synagogue. Jesus heals a man with a hand that is more distorted than "shrivelled" which is obviously far easier to film. He then cures a man who is blind and mute which is, for some reason, thought to be the result of demon-possession. The demon possession is critical to the following passage. Jesus is accused of casting out demons by the power of Satan. Jesus suggests that "every kingdom divided against itself will be ruined". Whilst all this is going on the camera is lingering on a woman behind the screen in the synagogue. She's dressed in a manner that suggests she's a prostitute, but the chances of such a woman being allowed into the synagogue seems remote. In any case the filmmakers use a few point of view shots from her angle, obscuring the view with the meshed screen in front of her. I remember Peter Chattaway talking about this being a conventional way of suggesting romance, but I can't remember if this is exactly the kind of thing he was talking about. From the attention the camera gives to her I suspect that we will encounter her later. We then cut to lakeside where Jesus starts to preach his Kingdom Parables (the third discourse). Having delivered the parable of the sower (and had Matthew and one of his scribes quote from Isaiah) Jesus and his disciples on the boat with Jesus at work tying knots. I always like it when films show Jesus doing something other than preaching. The next parable is that of the wheat and weeds. Jesus and his disciples are on the move this time, and here they half act out the parable, with the disciples seemingly improvising some of the lines. It's somewhat reminiscent of Godspell. This time it's Judas who asks for an explanation of the parable which is a nice attempt to present him as a more rounded character. Then it's back to Nazareth, at point at which many scholars consider the second half of the gospel to begin. This point acts as a hinge and its interesting that Jesus is back in Nazareth (where the story began) and a Herod is about to commit a violent act. More of that next time. Alex Proyas (Knowing, Dark City) has signed up to direct the movie with Legendary Pictures. Stuart Hazeldine, Byron Willinger, Philip de Blasi and Lawrence Kasdan have all worked on the screenplay. Thomas Tull and Jon Jashni will produce with Warner Brothers involved as well. Thanks to Peter Chattaway for that. Chapter 10 of Matthew's Gospel opens with the calling of the twelve disciples. Jesus is particularly touchy feely here, even kissing Judas's hand as he names him. There's a chance that this more accurate than the more stoic calling we usually see in films about Jesus. I know, for example, from my own time in Morocco that men will happily walk down the road holding hands, and Judas's sign in Gethsemane (a kiss) cannot have seemed too out of the ordinary. The scene does feel a bit strange in some ways however because it's narrated, and only the twelve appear to be present. It doesn't feel like we are witnessing an occasion when their status is being confirmed just Jesus working his way around the group. The twelve were, of course, called for the purpose of mission, not just as a status symbol, and so Jesus embarks on his second major teaching block in this gospel, telling them how they (and presumably Matthew's audience) should carry out their mission. This was my favourite section of these two chapters. Jesus does the voiceover to images of the disciples going around in pairs preaching the gospel. Sometimes they are welcomed into homes, sometimes they are chased out of the city. It's a nicely put together sequence, and not something I'm aware that another film does. The mission completed we see Jesus encountering John's disciples who travel an awfully long way for a very short conversation. Somewhere along the line we also see Matthew having to wake his scribes up again. It's played for gentle comedy, but it seems a bit silly. The gospel isn't that long, and why does Matthew so often narrate late into the night? I'm hoping that this will link up with the disciples sleeping in Gethsemane somehow. We'll see. Lastly we end with a few more disconnected sections of teaching, shot in a marketplace. Some of these feel quite authentic with piles of vividly coloured spices and more middle eastern looking faces. Different blocks of teaching are shot in different settings, again reflecting the composite nature of some of these teaching blocks. It's a good scene. Having listened to 3 chapters of Jesus teaching, the next 2 chapters of Matthew's Gospel follow him in action. To start with there are a flurry of miracles, a leper is healed, as are the centurion's servant and Peter's mother-in-law, then a demoniac is exorcised. Jesus then offers a couple of pithy sayings to his would-be followers ("foxes have holes...but the son of man has nowhere...", "let the dead bury their own dead") before calming the storm, dealing with the Gadarene demoniacs and healing a paralytic. He pauses briefly to call Matthew the Tax Collector and offer the sayings about wineskins and patches on clothes before ending on another flurry of miracles, haling Jairus's daughter, a haemophiliac, two blind men and a man who cannot speak. It's an action packed segment, but whereas the inaction of the Sermon on the Mount forced the filmmakers to plumb their creativity, here things are more standard. There are a few exceptions. Having healed the leper Jesus proceeds to roll on the floor with him. I know for some people this is a really good moment, but personally it leaves me cold. Perhaps I'm a Pharisee? 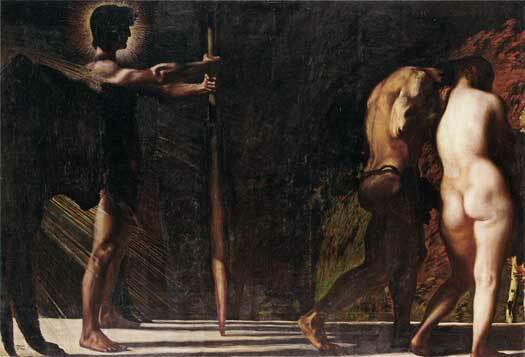 Another interesting moment is when the demons are cast out of the men from Gadara. The filmmakers swap their standard camera for a low hand-held one and give us the shot from the point of view of the pigs/demons. It works reasonably well, although the death of the pigs is less attention grabbing than it is in the text. 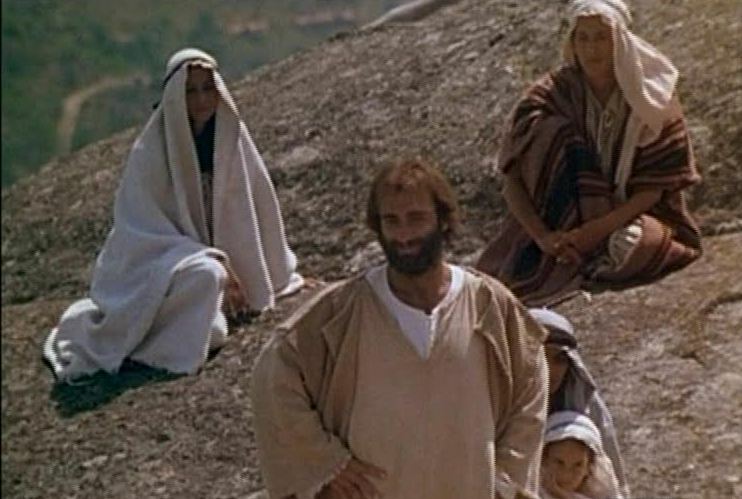 Filming the Sermon on the Mount was possibly one of the greatest challenges in making this film. How do you take an acclaimed text, most likely composed of several pieces of teaching joined together rather than a transcript of an actual sermon, and make it interesting to a film audience? It's possibly the place where this production feels least like a film and more like what it calls itself, a visual Bible. As Mark Goodacre has noted in his defence of the Farrer theory, most filmmakers tend to break up the sermon and distribute segments of it throughout their movies, just as Farrer theory proponents imagine Luke did. Not doing so makes this section rather tedious. The filmmakers introduce a number of measures to enliven the scene, and Marchiano enthusiastically delivers his words with heart, passion and humour, but they are only partially successful. Indeed whilst Marchiano's smiling delivery hits the right note on numerous occasions, it's when Jesus, or Matthew, resort to something more goofy that things come off as false and somewhat corny. So for example, to illustrate "do not let your right hand know what your left hand is doing", Jesus ours water over Peter's head. (This Peter takes it in good humour. Brian Blessed would probably have smacked him one). Later on Matthew almost sits on a child and Jesus holds a huge staff to his eye to demonstrate the speck vs plank passage. The other technique that's used to aide the attention deficient is by swapping between Jesus delivering the sermon and Matthew recalling it. The Matthew sections don't work quite as well, partly because he's addressing only a handful of family members - a setting that isn't so well matched to delivering a grand sermon. That said one of the most impressive moments is when Marchiano's words ring out through Matthew's (?) house. Covering the Sermon on the Mount also runs the filmmakers into another quandary, how do they resolve the places where their value of wanting to reproduce the book word for word clashes with the positive friendly image of Jesus they wish to portray. Whilst the sermon is rightly celebrated for view of a better humanity, it also talks about people being thrown into hell, somewhat at odds with the smiling Jesus the film wants to portray. The problems are resolved somewhat unsatisfactorily. At times Jesus or Matthew smile extra hard when delivering those passages. At others they wearily acknowledge them as unfortunate truths. This was never a problem that Pasolini's angry Jesus ran into. Speaking of which, one of the things that is most often pointed about that film is the way in which is films Jesus speaking against different backdrops and weather conditions to draw attention to its composite nature. 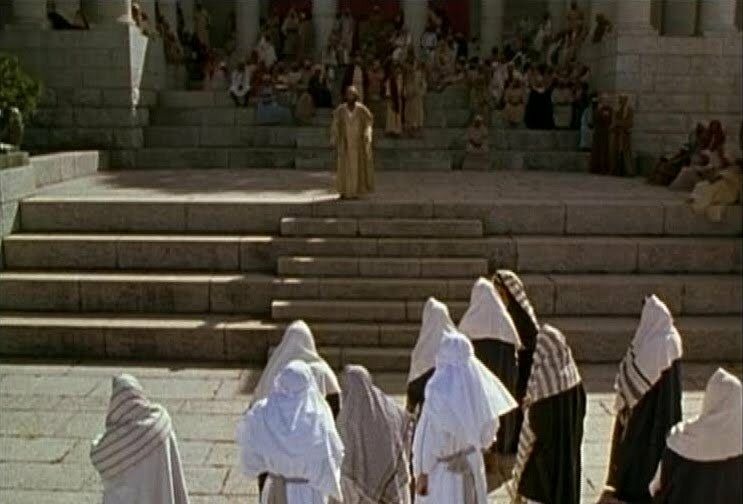 At first glance this film appears to be the polar opposite - Jesus delivers the sermon to the same crowd, in the same location, wearing the same clothes. But the weather changes quite significantly. Early on, Jesus is speaking under a azure blue sky, strongly reminiscent of Ray's King of Kings (1961). But by the end of the sermon three chapters later, things have clouded over and the ending of the sermon is rather lost in a thunderstorm. It helpfully illustrates the rain coming down on the foolish man's house, but is perhaps a little distracting. But crucially it suggests, perhaps unintentionally, that the sermon was in fact somewhat longer and that this is merely only edited highlights. Chapter 3 of Matthew's Gospel opens not on Jesus but on John the Baptist. Like many Jesus films, the Baptist's appearance (see above) is significantly more alien to modern western eyes than the other characters. Here John has wild unkempt hairas well as the camel skin clothes that the gospels attribute to him. The first shot of Jesus is usually a moment of some significance in Jesus films. The King of Kings (1927), for example, introduces him through the eyes of a blind girl as she gains her sight. The majority of films about Jesus tend to use his baptism as the moment he is first revealed and, given the nature of the project, this film is no exception. The sequence is actually very artfully put together. John's teaching seems to have finished, and we see children playing in the water. Then we see the feet of a man walking through the mud at the side of the river. The symbolism is fairly rich here. God has come down in human form and his getting his hands feet dirty. God is standing, quite literally on the earth. Next we get the image of a man reflected in the water. The Jewish Messiah seen only as a pale reflection is about to be revealed. Jesus' baptism is by immersion rather than sprinkling, and as he emerges from the water the shot is slowed down as a jubilant Jesus looks to heaven. Matthew then narrates the arrival of the dove, but we are denied a shot of the dove itself. Instead we get shots of John's reaction. In a similar fashion, rather than representing God's voice (such as a detached, echoing voice) it is the narrator who delivers God's encouragement. This may simply be because the filmmakers have learned from other Jesus films where their star is left to stand in cold water for hours at a time whilst they try and get a dove to land on his shoulder. Brian Deacon, star of VB Matthew's close relation Jesus (1979) still recalls just such an incident in that film somewhat painfully. But it's also possible that this is a nod to the fact that in Matthew's Gospel (1:10) the dove is only a simile. Luke makes the simile more concrete by stressing the Spirit is descending "in bodily form". We are also never told whether or not the voice from Heaven is audible. Either way the scene is handled very well, leaving intact the ambiguity of the text. Just as "Matthew" speaks God's part, he also delivers the devil's lines as well. I wonder whether, as we progress through the film the narrator will always deliver the lines that are more subjective, in a similar fashion to how The Miracle Maker switches to 2D animation at similar points. That said I seem to recall that in the opening chapter an angel speaks with an echoey voice at one stage. he director uses several cuts during this scene to emphasise the passing of time, in marked contrast to other Jesus film (such as 1999's Jesus) which show all 3 temptations as part of the same event. Here you get a sense that these three temptations are representative of many over the 40 days, rather than depicting the entire temptation incident. There's a brief scene of Jesus calling his first four disciples. There's no discussion Jesus just waves his hand and the two pairs just follow him. It actually suggests though that these men are not strangers, and thus that Jesus' signal is more of an "it's time" than a call out-of-the-blue. The chapter ends with a round up of Jesus' miracles realised on screen by showing a lame woman being healed. She hugs Peter (as well as Jesus) which raises the question as to whether this is his mother. I'll have to remember to look out for that when we reach chapter 8. We then cut to a very large and rather inaccessible rocky outcrop. Peter even slips as he ascends the mountain. A certain sermon is clearly about to begin (start of chapter 5), but strangely it seems doubtful that any of the infirm will be able to get there. I had a job interview at the end of last week, hence the lack of output over the last few days. I do however have a bit of time of this week so I should be able to post more regularly. This post is the second in a series working through Visual Bible's Matthew. After the opening, unscriptural prologue, the film moves on to adapting the gospels proper. As soon as they begin it becomes obvious why the prologue was deemed necessary: opening with a genealogy would result in the dullest start to a movie of all time. As it is things are still pretty dull, despite the filmmakers attempt to liven things up by having some of Matthew's (spiritual?) grandson chip in the odd name or two. This is one of the drawbacks of doing Matthew's Gospel word for word and both filmmakers and audience breathe a sigh of relief when it's all over. Essentially, the genealogy is the gospel's prologue, so by beginning the film by introducing Matthew we have now had two prologues; what follows will function, in many ways, as a third. Some would the historical credibility of the Nativity Story, and in a way, the film, no doubt unintentionally seems to back this up by leaving Mary and Joseph without dialogue. This is, of course, due to the dialogue in the gospel. But translating that to the screen outs these characters in a remote and unreal light. The lack of dialogue also creates an interesting scene between Mary and Joseph. Mary communicates her pregnancy to Joseph with looks rather than words. This seems to be a nod to Pasolini's adaptation of this gospel, which opens in similar fashion. That said, in that film the possibility remains open that the two have already spoken, or that Jospeh has heard via a third party. Here however Joseph greets her with a smile, and only when he reads her looks does he learn that she is with child. Like Jesus of Nazareth Joseph is depicted with a covered head and side curls. On the one hand, this indicator of Jesus' Jewish roots is commendable, if, perhaps, a little anachronistic. But it does raise the question as to why Jesus is not shown in such a light. We have no reason to suggest that Jesus was less devout in his religion than his father, for all his critiques of its current practice. Perhaps the most interesting feature of this segment is that there are more than three wise men. The number doesn't seem to be completely consistent, the numbers riding on camels seem to be perhaps one or two more than the four that kneel and present gifts to the baby (rather than toddling) Jesus. Either way the filmmakers are at pains to distance themselves from the three wise men of our traditional Christmases. Next time John the Baptist and the temptations. Jeffrey Staley, co-author of the indispensable "Jesus, the Gospels, and Cinematic Imagination: A Handbook to Jesus on DVD" has a new article out in the latest "Teaching the Bible ePub" from SBL. "The Crucifixion of Jesus in Films and in the Gospels" looks at how various films about Jesus portray the crucifixion and how that relates to what we know from the gospels and history. Like Staley's book, the paper is particularly interested in how Jesus films can be used in teaching contexts, and so fittingly he ends with a number of 'Questions for the Classroom'. Thanks to Mark Goodacre for mentioning this. I've written a new piece at rejesus.co.uk about the new Bollywood Jesus film that was announced this week. It combines some of the comments made in the Variety article with some of my original observations as made on this site earlier in the week. It's been a while since I reported on the Biblical Studies Carnivals, in part because they seemed to die a bit of a death in the early part of the year. Thankfully Jim West has resurrected them. I believe he started last month with a look at July's blog posts, and now he has posted the August 2010 Biblical Studies Carnival. Jim very kindly mentions this blog twice, once for the 1000th post, and once for my Gospel Comparison of the Disciples. Thanks Jim. The latest Top 50 Biblical Studies related blogs has also been posted. According to The Guardian Bollywood star Pawan Kalyan is set to play Jesus in a new film to be shot on location in Israel/Palestine. "A $30m (£20m) production involving an all-Indian cast of mainly children will begin shooting on location in the Holy Land in October and is scheduled for release next year." The film has not yet been given a title and the script is still in production but it will apparently cover the Jesus story from his birth to his crucifixion. That suggests that there will be no resurrection, but time will tell. However The Globe and The Mail's piece on this suggests the story's focus will be on Jesus' childhood. Variety has also reported the story. (Thanks to Peter Chattaway for those two). This brings two other films to mind. The first is another Indian Jesus film Dayasagar (also known as Daya Sagar, Oceans of Mercy, Karunamoorthy, Karunamayudu) which includes the resurrection (and ascension) as well as Jesus' birth and his childhood. The other is The Aquarian Gospel, another Indian film that was intending to focus on the period of Jesus' life that is not covered by the gospels. I've not heard anything on that film since 2008. 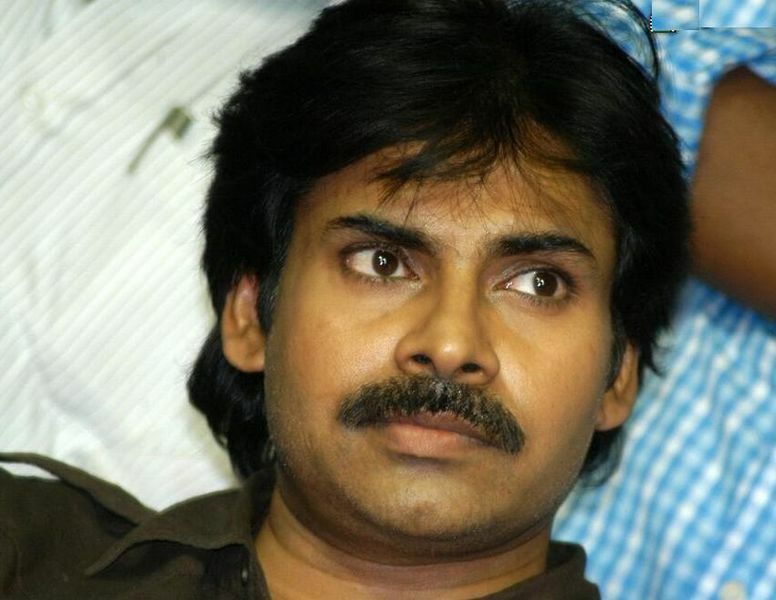 According to the new movie's director, Singeetham Srinivasa Rao, this latest production will be 195 minutes long, featuring seven songs, in four languages (including English). At $30m it will be one of the most expensive Bollywood films ever made. According to a poll for Vanity Fair / 60 Minutes, only 20% of those questioned thought that they were less likely to watch his movies as a result of his recent outbursts. Also covered at The Guardian.